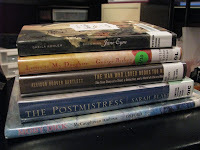 Library Loot is co-sponsored by Eva of A Striped Armchair and Marg of Reading Adventures and is a great way for us to spotlight our recent library acquisitions. I really have no business bringing home any more books; I have too many books that I must read this semester. But several of these books have been reserved for weeks and they all just happened to become available at the same time. The good news is that my spring break has officially started (YIPPEE) and so I should have some free time to read pleasure books as well as academic ones. Add these books to the few that I have remaining from previous library trips, as well as books that I should read for summer, as well as my own personal TBR bookshelves, and I don’t think I will be at a loss for what to do over this break. I just bought The Postmistress on my Kindle…I can't wait to read it! The great thing about libraries is that nobody stops you from checking out ten books, and you can always renew! It is a beautiful thing! Have a great spring break! Whenever I put several books on hold, they all come in at the same time. It looks like you'll be in for some good reading this week. Enjoy! congrats on your new reads. you can never have too many books! I just bought the Postmistress on my Kindle too! I also like the look of Becoming Jane Eyre and I have Letter to My Daughter here to read as well. Molly, have a wonderful spring break! It's always when you have too many books at home that the ones on hold come in! Happy reading! I find it really funny how we all apologise profusely for the amount of books we bring home. We are always making excuses, but what we really should do is rejoice! I don't drink, I don't smoke, I don't have a thing for shoes, handbags or jewellery,so I should be allowed a little vice with my books! I think you are going to be busy reading for a while. I for one am really looking forward to your posts about Oxford and Paris, because we know you are going to visit France before you leave England. I'm looking forward to what you think of Postmistress. I read it with the First Look Book Club. Everybody is talking about it. The travel writing books appeal to me. As much traveling as we have done, I don't feel good about my ability to talk about what I've seen. 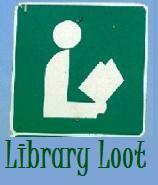 I'm going to see if my library has any of your titles. got some good stuff here! Hope u enjoy letter to My Daughter (it's good and a quick read). Postmistress is one that I am looking forward to as well –enjoy them all Molly.